On the 18th September 2014 the people of Scotland voted to decide if they should become an independent country. While the idea was rejected, it was done so freely, fairly and democratically. Having been elected as a majority government in the Scottish Parliament with a referendum in their manifesto, the SNP and the British government came to an agreement which allowed the vote to take place. Both the Yes and No sides campaigned freely, police manned polling stations but only to ensure the vote went smoothly, and key figures on the Yes side such as Nicola Sturgeon have gone on to have successful careers within the UK, even if they wanted to break it up. How different the situation in Catalonia is today. Once more, the pro-independence parties won a majority in the parliament with a pledge to hold a referendum and once more the region’s president, Carles Puigdemont, asked the government to negotiate. However, this time the request was met with silence. Following a sustained attempt to hold a referendum with the permission of Spain, Catalonia went ahead and voted anyway. The referendum was approved by the Catalan parliament and, despite attempts by the Spanish police to prevent it, on the 1st October polling stations across Catalonia opened. The response from the Spanish police was nothing less than deplorable. While the Catalan Mossos d’Esquadra refused to stop people from voting, Civil Guard agents, shipped in from the rest of Spain, smashed their way into polling stations and forcibly tried to stop people from voting. According to the Catalan Health Department, 844 people in total were treated “as a consequence of the actions of the Spanish Police.” Despite this, over 2 million Catalans, 92% of those voting for independence, still turned out to have their say. Catalonia went on to declare its independence. “Many of us thought that after the proclamation of the Catalan Republic on the 27th of October Spain would listen and negotiate,” states independence supporter Eva Plarramaní. However, since then, things have only got worse. Catalonia’s regional government has been placed under direct control of the Spanish government and prominent Catalan leaders have been arrested or forced to flee abroad, with the threat of up to 30 years in prison for their actions. 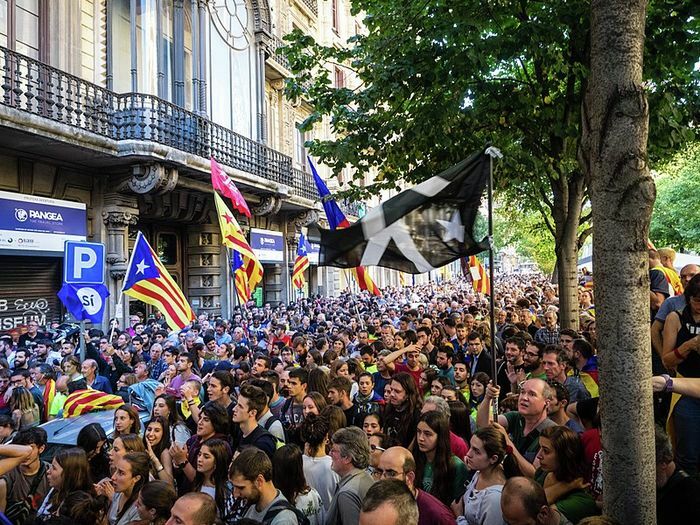 Ordinarily Catalans can’t seem to agree on much, but one thing they do concur on is the right to decide. According to an opinion poll taken by El País, a leading Spanish newspaper, 82% of Catalans support holding a legal referendum on independence. The Spanish Government’s response, the arrest of leaders simply for holding a political stance and the beating of innocent, often elderly, voters, for attempting to voice their opinion calls into question the very idea of Spanish democracy. Spain may claim that it is simply “upholding the law” in Catalonia; however, this means very little. History has shown us that just because something is “the law” doesn’t make it right or democratic. Opponents of a referendum claim this it is unconstitutional, a matter for the whole of Spain to decide – yet this argument beggars belief, equivalent to a wife telling her husband she wants a divorce, and her husband refusing on the grounds that it should be decision for them both. The UN Charter, which Spain is a signatory to, clearly recognises nations’ and people’s right to self-determination. Catalonia has its own language, its own history and its own culture: that much is clear to anyone who has lived or spent an extended period of time there. While this doesn’t qualify it for independence by itself, it does give it the right to decide. The Spanish government must negotiate an agreement on a referendum that can be respected and fought freely, on both sides such that the wishes of the Catalan people are truly heard. Unfortunately, as it stands, this outcome couldn’t seem further from the case. With an increasingly politicised judiciary, a central government unwilling to negotiate and a monarch happy to side with the government on a political issue, Spain’s slide into autocracy seems likely to continue. We can no longer turn a blind eye to Catalonia’s suffering.